Find Endless Costume Ideas and Possibilities for the Oak Lawn Halloween Block Party 2018. Saturday, October 27th, 2018 7 PM – 2 AM in the Oak Lawn Dallas Neighborhood. We are the Largest Halloween Costume Shop and we are open all year round. This Dangerous Pirate Lady Costume is just one of tens or thousands of Supreme Quality Halloween Costumes we keep in stock. Remember, this is only one example of the Quality and Variety we offer. We also offer Median Priced & Economy Priced Costumes & Accessories for Kids Halloween and School Project Costumes. Just look at our very long list of Categories on the right of the screen. You will never find a Halloween Costume Shop with this volume and selection of Quality Costumes, Period Garb and any Accessory you will ever need to complete any Halloween Costume imaginable. Oak Lawn #BlockParty Tickets: Admission to the Street Party is FREE!! 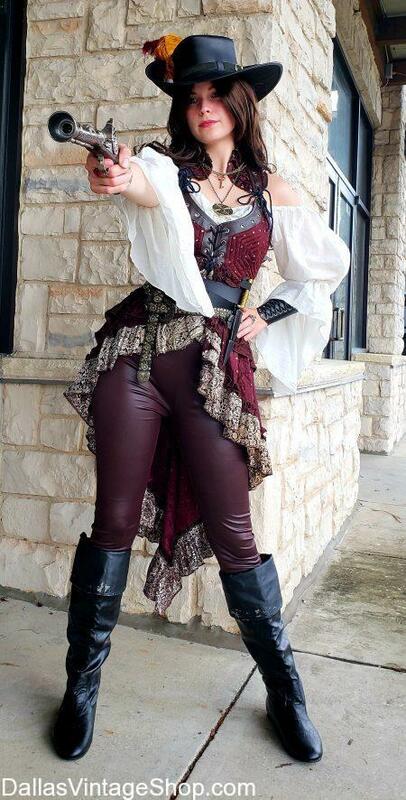 This Oak Lawn Halloween Block Party 2018 Dangerous Pirate Costume provided by Dallas Vintage Shop. “Start planning now for The Annual Halloween Street Party just a few months away.. The Oak Lawn Street Party which has turned into a major Dallas event returns Saturday, October 27, 2018 (the Saturday before Halloween) from 7pm to 2am in the 3900 block of Cedar Springs. The event features the Costume Promenade, with live commentary, music, food, beer and other refreshments will be offered at seven service booths. Be sure to catch the Live DJ and featured Rose Room performances in the back lot! Admission to the street party is free. Also, do not miss the Roundup Saloon’s entire bar that is in full Halloween theme decorated by the staff. All ages welcome at the street party, but beer sales limited to 21+ only. The event area will be fenced. In accordance with state law, no personal liquor may be taken into the permitted area. Coolers are not permitted, and bags may be screened. Please be kind to our neighbors! Cruisin’ the Crossroads suspended for this event. Find Oak Lawn Halloween Block Party Information. Saturday, October 27th, 2018 7 PM – 2 AM in the Oak Lawn Dallas Neighborhood. If you are looking for HALLOWEEN DFW LARGEST COSTUME SHOPS you have just found it. 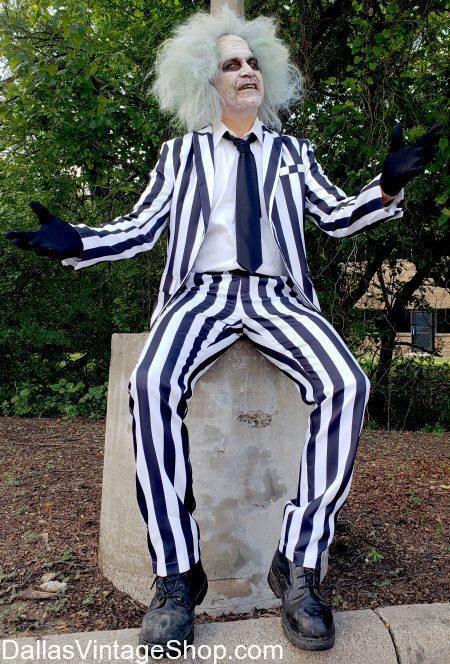 This Beetlejuice is always a Popular Halloween Costume. This Quality Halloween Outfit is just one of tens of thousands of fantastic Halloween Costumes we keep in stock all year round. We have the Halloween Characters you want and we have the Halloween Makeup, Halloween Wigs, Halloween Accessories and Halloween Extras that you cannot find anywhere else in the Dallas, DFW, North Texas Area. We Have the Volume and Variety of Halloween Costumes that no other store can claim. You will Find Supreme Quality Halloween Costumes that are Celebrity Status Worthy. But, you will find Median Prices and Economy Priced Halloween Costumes too. Nowhere will you find Halloween Costume Choices like Dallas Vintage Shop Offers. Assemble, from scratch, your own unique version of any Halloween Character, Halloween Witch, Halloween Movie Character, Halloween Horror or Haunted House Characters, Legendary or Traditional Halloween Characters, Fantasy or Historical Halloween Story Characters and any Halloween Costume imaginable is here, waiting for you. We are open all year round, just remember to shop early for Halloween. We will not run out of Halloween Costumes but the earlier you shop the easier it will be to get around the store and the more help and suggestions we can provide you. If you want a really Killer Halloween Costume with Unique Custom Features, please, shop early, shop early in the year, early in the month or October, early in the week(weekends get crowded), shop early day and come prepared to have the Halloween Costume Shopping Experience of your dreams. This Oak Lawn Halloween Block Party 2018 Beetlejuice Costume provided by Dallas Vintage Shop. We Have Complete Details For the Oak Lawn #BlockParty Listed and Linked Below. Saturday, October 27th, 2018 7 PM – 2 AM in the Oak Lawn Dallas Neighborhood. Dallas Vintage Shop has the HALLOWEEN COSTUMES DALLAS! Our Halloween Costume Megastore is DFW’s Largest Costume Shop, Your Halloween Costume choices are unlimited. Get Tens of Thousands or Supreme Quality Halloween Costumes with all the Halloween Accessories like Halloween Supreme Quality Wigs to Economy Priced Wigs, Halloween Supreme to Economy Makeup to Economy & Prices for the Kiddos and Halloween Costume Accessories like Weapons and Accessory Items you have never thought of. Nobody beats our quality, quantity or variety when it comes to Halloween Costumes in Dallas. We are open all year round. Shop early for Halloween to avoid the crowds. We will not run out of Halloween Costumes but as other Halloween Shops get picked over and online Halloween sites run out of selection then everyone will come to Dallas Vintage Shop, so be warned! This Oak Lawn Halloween Block Party 2018 Lydia Costume provided by Dallas Vintage Shop. We Present To You the Oak Lawn Block Party Halloween Complete Guide. Saturday, October 27th, 2018 7 PM – 2 AM in the Oak Lawn Dallas Neighborhood. Find any Halloween Costume you can imagine for this fun, popular DFW Event at Dallas Vintage Shop! 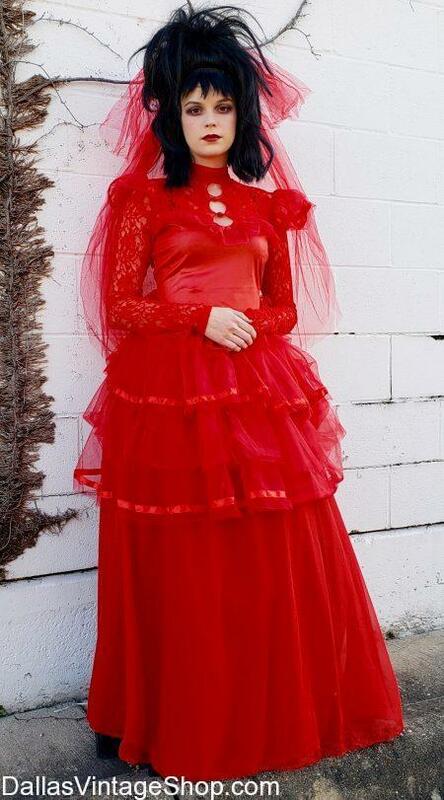 For the Largest and Most Diverse Collection of Halloween Costumes Dallas has to offer, come to Dallas Vintage Shop. Get Scary Halloween Clown Costumes & Masks, Horror Movie Characters, Halloween Scary Movie Costumes, Halloween Theme Party Costumes & Accessories, Kids & Adults Halloween Costumes, Sci-fi Halloween Costumes, Fantasy Halloween Costumes, Superhero Halloween Costumes, Time Period Halloween Costumes, Vampire Halloween Costumes, Creepy Halloween Costumes, Humorous Halloween Costumes and the list could go on. Look at our Menu on the right to get an idea of all the kind of Costumes and Halloween Costumes & Accessories we keep in stock all year round. 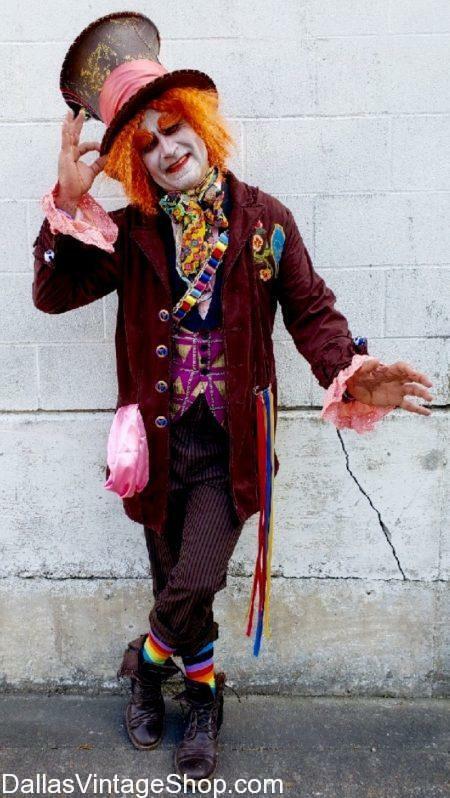 This Oak Lawn Halloween Block Party 2018 Mad Hatter Costume provided by Dallas Vintage Shop. You are in 2019 10/26 Oak Lawn Halloween Block Party category.